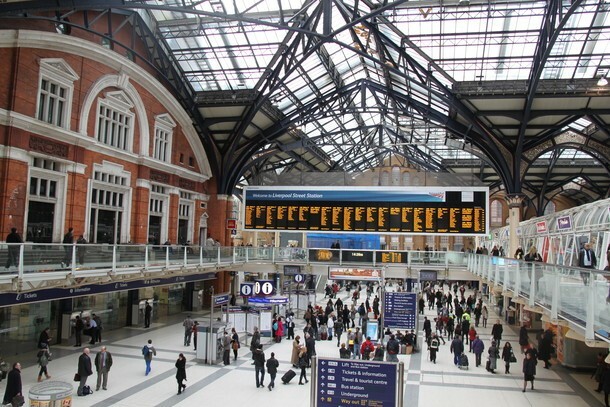 The history of Liverpool Street station - Crossrail . For information about the Elizabeth line please visit the Transport for London website. Liverpool Street station was built on the site of the original Bethlem Royal Hospital. The hospital, known as Bedlam, specialised in treating the mentally ill and is the origin of the word bedlam. The station was built in 1874 as the new terminus for the Great Eastern Railway to serve east London, Essex and East Anglia. The station had nine platforms operational by November 1875 and had a connection to the Metropolitan Railway, the world’s first underground railway. The striking station roof was designed and built by the Fairburn Engineering Company who also supplied the roof to the Royal Albert Hall. Liverpool Street station remained virtually unchanged until the mid-1980s when it was transformed by a major redevelopment programme. The redevelopment involved modernising station facilities and simplifying the layout of the main shed to align the end points of all of the platforms. The modernisation greatly improved the station environment, yet retained the grand 19th century architecture. Today the station has approximately 123 million visitors each year and serves London Underground, rail and Stansted airport passengers. Crossrail will provide Liverpool Street with new direct links to Canary Wharf and Heathrow airport and provide faster journey times to London’s West End.